Looking for an invoice template that will work for your residential or commercial cleaning service? We've got you covered. Do I need more than just a cleaning service invoice template? 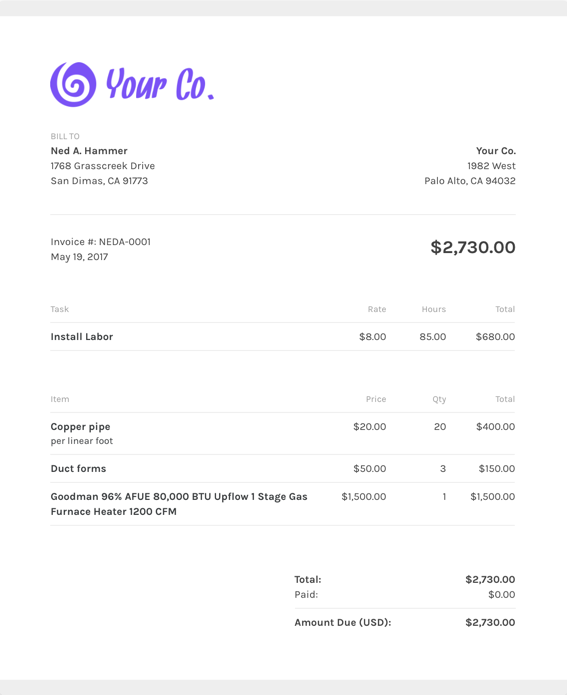 Since your company is all about cleaning, you're going to want a clean, professional invoice template to send out to your customers. But why settle for just a free cleaning service invoice template when ZipBooks can give you so much more? Our invoice templates include an invoice quality score, which will tell you what you can do to create the best invoice for your business that will you get you paid faster. Start invoicing with ZipBooks today! After trying multiple accounting apps for 10 years, ZipBooks was finally the solution. My clients can pay online & accept quotes through a simple, interactive process. Clients love it as much as I do. Chris Kelley Digital Craft Co.
After trying multiple platforms, ZipBooks proves to surpass all expectations. They make bookkeeping a breeze. Would recommend a thousand times over because it has been crucial to my business growth. Why not have bookkeeping software that is delightful and intuitive? Do you like using your old, boring software? Nah, didn't think so. ZipBooks rocks! This is by far the best app that has helped me with my small business. It has made accounting, invoicing, and tracking payments a breeze! I really love it! I never studied accounting, but I found this software to be very user friendly for basic bookkeeping. I was able to figure it out in a short period of time. ZipBooks, I love you! What should I include on my cleaning service invoice template? An innovative feature of ZipBooks invoice templates is that we will help you through every step of sending your first invoice. We help you to know what to include in your invoice based on real-time feedback that we provide in the form of a invoice quality score. Using ZipBooks for your cleaning service invoice never forgetting to include niceties that help you get paid faster like thank you notes. We’ve collected data from tens of thousands of invoices and use it to score your invoice based on what information you include so you’ll get you paid faster. Your Company Logo: This is part of the invoice template that you can add yourself. Save your company logo under company settings and your invoice template header will always match your other invoices. Invoice Notes: Thanking a customer for their business will always make you stand out in a crowd and helps you get paid faster. Invoice Payment Terms: Another great free feature of ZipBooks invoice templates is that when you put terms into an invoice, we automatically detect it and set the due date you chose. If you don’t set terms, we assume that the invoice will be due in 14 days. Don’t Forget Your Customer’s Information: This one might seem pretty straightforward, but it should always be on the list. Detailed Description of Charges: By manually entering in invoice details or using the time tracker, ZipBooks’ invoice template can show you a detailed account of everything that you have charged since you last sent an invoice. ZipBooks is much than just professional legal invoice templates. With secure document storage and built-in time tracking, we have all a complete legal invoicing solution that you can count on. Why should I use ZipBooks’ security invoice template to create and send my security invoice? ZipBooks doesn’t charge you anything to create and send invoices. We make money from our other services, like bookkeeping. ZipBooks has a lot more added features that other invoice software will charge you an arm and a leg for. That might be why you are looking for an invoice template and not invoice software. Seamless time tracking import (paid feature after trial period): You can track multiple clients, projects, and team members on different hourly rates based on the skill level of the person of the client, what project you are on or even based on the client. Late payment reminders (free! ): Reminding clients to pay isn’t that fun, but when funds are running low, it’s nice to know that you can setup logic based on when you sent out the payment and how long the client has gone without paying. You can setup an unlimited number of reminders that communicate an escalating sense of urgency about non-payment. If they are slow to pay you, can outsource the tedious followup task to ZipBooks. Credit card payment (free! ): Everyone knows that you get paid faster when you let your client pay by credit card. ZipBooks has the slickest invoice payment method of any invoice template that you’ll find. All you have to do is connect to ZipBooks payments and turn on the accept credit card payment option and the credit card payment form will show up right next to the online invoice. Auto-billing (free! ): There are zero auto-billing options that are free besides ZipBooks. If you use ZipBooks, you are going to be able to setup a recurring profile that sends an invoice to your client on a recurring basis that you set and if you enable auto-billing, your client will automatically be billed after they submit payment for the first invoice. You may not have gone into this looking for more than just a generic trade template, but since you found us, why not check it out? If you're a designer, photographer, or the like, and you're looking for an invoice template--you're in luck! We built ZipBooks with you in mind because that's our background. Invoicing by the hour was our bread and butter before starting ZipBooks. ZipBooks invoice templates are flexible to meet your unique requirements. We’re so confident that we have the invoice template that you need that you can email us at help@zipbooks.com if we don’t have the template that you are looking for! We have an invoice template that will work for you. Not only that, we’ve made invoicing faster and easier than ever before. Did we mention that we don’t charge for our invoice templates? That’s right folks! Our invoice templates are free to use.